High blood pressure (hypertension) is a leading risk factor for heart disease, stroke, kidney failure, and diabetes complications. Known as the “silent killer,” high blood pressure often has no symptoms until serious problems occur. Many people have high blood pressure and can go for years without knowing they have the life-threatening disease. Nearly one out of three American adults (68 million) has high blood pressure. Less than half have their conditions under control. Improving blood pressure control requires an expanded effort and an increased focus from healthcare systems, providers, patients, employers, and the entire nation. 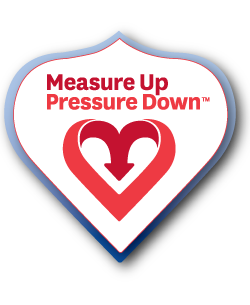 Measure Up/Pressure Down® is a three-year national campaign designed to engage these important stakeholders in improving blood pressure control and achieving lasting improvements that lead the way to greater health, productivity, and cost savings.